“Ole’s at the wheel, tell me how good does it feel!” crooned Manchester United’s fans, seated beside the Clock End at the Emirates Stadium. Right now, no United fan can really measure just how good they feel. From it all seeming bleak and a long way away from joy, United have roared back these last eight games. Winning all of them under their baby faced caretaker boss who has brought an unabashed swagger and identity back to the club. They no longer rely on a couple of individuals finding moments of magic; they are a team. A proper team. Here, we look at how the players in action on Friday night fared in a classic Cup tie full of drama and magic. United’s goalkeeper did not have the busiest of evenings, but a save from Aaron Ramsey with the game on the edge at 1-2 proved crucial. A great reflex save at a clutch moment, one that the keeper currently keeping him on the bench would be proud to call his own. Luke Shaw dealt with what Arsenal had to throw at him. Shaw has at times this season been out of position down his flank and used his pace to make recovery runs leading to last-ditch tackles. The same was on evidence occasionally, with Ainsley Maitland-Niles building moves down the United left with support from Aaron Ramsey and Alexandre Lacazette. Shaw, however, surged to lay the ball into Romelu Lukaku’s path for the United’s second which proved vital. His general involvement in the Red Devils’ work up top was also healthy. The ‘Ice-man’ was cool and efficient with what came his way. He and compatriot Eric Bailly did not allow much of Arsenal’s labour up top to pass through the centre. Not in any way to blame for the goal, Lindelof had another steady showing. There weren’t his usual forays forward, but the game demanded solid composure from him and he delivered. Not the most demanding of games for the Ivorian, but like his Swedish compatriot, he was assured and dealt with the questions Arsenal asked of him. Why such a harsh score on a night of excellent performances? Because Ashley Young has been a loyal and fantastic servant at United, but his time as a first XI player is running out. It was evidenced by the roasting Alex Iwobi and Sead Kolasinac gave him, leading to the Aubameyang goal. Young does not have the engine to consistently add to United’s attack either. He could be a great mentor to United’s young lads and be a backup, but Diogo Dalot’s time could be at the door soon. ‘Static Matic’ has undergone as profound a change under new management as the likes of Paul Pogba. Again, he was quicker on the ball, finding passes rapidly. Not short of bite, he continued to underline how he and Ander Herrera offer a safe, solid canvas for the showmen to add colour on top of. Busy as usual making a nuisance of himself, Herrera had a job to do and did it. With a usual mix of ‘well-timed’ fouls and laying the ball into United’s front men, Herrera continues to be a street-smart player perfect for this kind of occasion. Not at his best in a rather innocuous first half, the Frenchman’s engine seemed to purr late on in the game. Was the driving force behind most if not all of United’s counters in the second half and his link-up play with Sanchez, Lingard etc was a joy to watch. 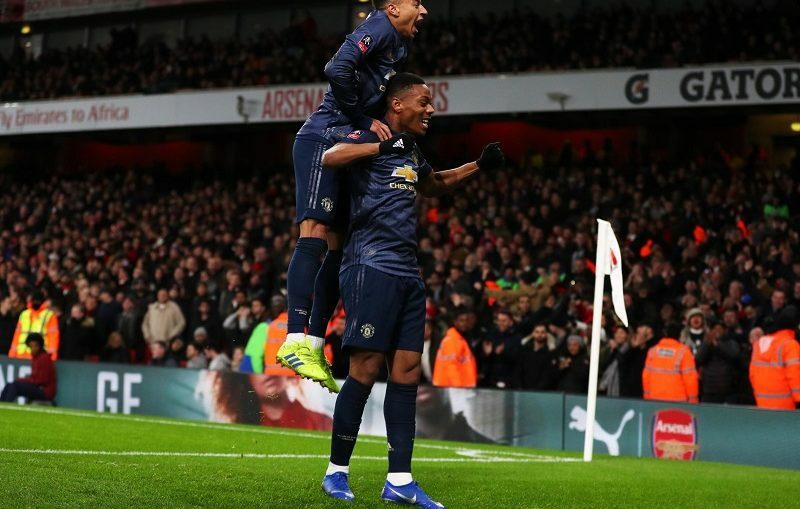 When United seemed to be buckling under Gunner pressure, Pogba galloped willingly with the ball on the break, popping the shot off for Anthony Martial’s third. He did not help his left-back very often and wasn’t at his marauding best for long spells. Thankfully, the team stepped up whilst he found his feet. Tenacious, gritty, so very smart and aware. Jesse Lingard had a fantastic showing, helping out defensively, finding little spaces up the field and being in the right areas at the right time. With his insatiable running desire, Lingard has also matured into a very intelligent footballer. A very well taken second goal, a Milly Rock to follow, and his fiery defence of Marcus Rashford in the chaos at the end stand out. He’s not universally liked, but you’d be hard pressed to find anyone of a Red compulsion not love Jesse. He had a point to prove, and prove it he did. For all his troubles, Alexis Sanchez had no trouble rolling up at his old club, and dumping them out the cup with a quite glorious finish. Very hardworking, available on the turn and run, Alexis had one of his better showings in United colours. While the goal was terrific, a lot else of his work had good intentions, but not the accompanying end product. Consistency must follow and United might see the best of him eventually. Ridiculed for his clumsy touches and slandered for a lack of game intelligence, Romelu Lukaku arrived at the Emirates hurting. Having lost his place in the side to Marcus Rashford, Lukaku showed great spirit on Friday night. A delightful ball with the perfect weight and disguise that no one expected led to the first. The second showed his strengths when the ball is played into space ahead of him. A good run and an intelligent pick out followed. He petered out in the second half, but by then, he had already dealt a death blow to Arsenal hopes. Brought legs when he came on, and got into good positions, but nothing concrete came his way. A rather unnecessary fracas at the end that he ignited proved luckily harmless. Could have got on the scoresheet had Pogba passed it to him instead of taking a shot before the third goal. Not a game where he had a chance to do what he likes; put his head down and run at defenders. Seemed absent until he was on hand to snap up the rebound for the third goal, killing Arsenal off and sealing United’s passage. As for the manager? If I could award him an 11, I would. He spoke post-match of having played videos of great counter-attacking goals United have scored against the Gunners in the past to his players. The club is his heart, and the players seem to feed off that. United look a fully rejuvenated, dangerous football team again. Will they continue to offer more thrills, goals and wins? Of course, they will. They are Manchester United.